OK you girl wanderers, we’re back! Today I’m excited to introduce you all to Alexandra Baackes from Alex in Wanderland. Alex is probably one of the most active bloggers I know, publishing new posts almost daily even while she’s travelling! I try to post once a week and even then I seem to struggle, so I really have no idea how she does it. Globetrotting full time since 2009 and certainly no stranger to going solo, Alex now has a travel blog literally overflowing with useful info about all things travel. You’ll find she writes quite candidly about her adventures and personal experiences, which is always refreshing and is really what travel is all about. Hopefully, you’ll get a little glimpse of that in our interview below. Introduce yourself! Who are you? I’m a New York native on the move, documenting every highlight and heartbreak on alexinwanderland.com. I wear many hats, but I consider myself above all a writer, designer, and globetrotter. What was the first trip you took abroad by yourself? What was your inspiration? When I was nineteen I spent a solo summer in Southeast Asia volunteering at an animal clinic, learning how to scuba dive, and falling head over heels with the backpacking life. I often tell people my inspiration was the movie The Beach and they laugh because they think I’m kidding, but I’m not – I too wanted to drink snake blood in the back streets of Bangkok and stumble upon a beach commune run by Tilda Swinton. What’s the response been like to you going nomadic and breaking the ‘traditional’ mold of job, marriage and kids? Thankfully I’ve never felt much pressure to do things in a way that resembles normal. I’m approaching my third anniversary of nomadic lifestyle and I definitely am starting to get a lot of questions from friends about when I’ll settle down. All I know is it won’t be anytime in 2014 – I’ve already got a fully booked travel schedule! The biggest concern for travelling solo as a female is safety. How do you get over that fear? What steps do you take to make sure you stay safe while on the road? I simply trust that the good judgment and instincts that keep me safe at home will do the same on the road. I remind myself that the majority of people in the world are out to help me, not harm me, and I just go. Many people are reluctant to travel solo because they feel like they’ll be alone and won’t meet anyone. What’s your experience? As I am always working when I travel I find that I have to make a conscious effort to be alone when I need to be. Backpacking is the world’s easiest way to meet new people and make new friends, and every aspect of it – staying in hostels, taking mass transit, signing up for activities and tours – is designed to put you in contact with like-minded people. I actually love solo travel as it is so much easier to meet everyone and anyone! When you travel in a group or with a partner you’re naturally less open to the world. I’ve met some of my best friends in the world on the road. I was just bridesmaid for one of them! Where are some places you’ve had to deal with unwanted advances or harassment from men and how do you do it? I have found traveling in Southeast Asia, I experience very little unwanted attention. When I arrived in Indonesia and started getting a lot of commentary based on my long blonde hair I simply started tying it up before going out and it eliminated the problem. In South America machismo culture is alive and well and in the beginning I was taken aback by some of the harassment I received. But I reminded myself it was less of a threat and more a symptom of the culture, and I just tried to ignore it. How do you afford your travels? That’s a short question with a very long answer! I make money via my blog and my freelance writing and design work and I saved like a maniac before I took off. In general, I need very little income to sustain my lifestyle. I travel to cheap regions of the world, I move slow, I play the frequent flyer points game, and I rarely if ever buy tangible things. I break down my monthly spending in my roundup posts, but it usually hovers around $50 a day all in. OK, a couple of fun questions – who’s your celebrity crush? And, which country have you been to that, in your opinion, has the most handsome men? I haven’t been to South Africa yet but I’ve met many of its men on my travels. And I can’t get enough of that accent. Imagine a Hollywood studio wanted to make a movie of your life. Who would play you and why? Christina Applegate. I think we have similar mannerisms and she tends to play fairly neurotic characters, so I think she’d have had plenty of practice. Are you a nomad for life? Why? Why not? Jury is still out. I am slowing down considerably and often miss the routine of the real world, but the road keeps calling me back. Also, I have no idea where I’d “settle down,” even if I wanted to. New York will always feel like home, in a way, but I don’t think I could put myself through those winters ever again. I think in my ideal world, I’d spent a third of the year in the US with my friends and family, a third of the year in a home away from home overseas, and a third of the year traveling. Lastly, for those planning or considering their very first trip alone, what advice do you have for them? And where would you recommend they go? Thailand is my second home and I can’t think of a better place for a first big solo trip. It’s affordable, safe, and friendly, and the tourism infrastructure is well in place. And my advice? Build a flight change fee into your budget right off the bat – you’re never going to want to leave. 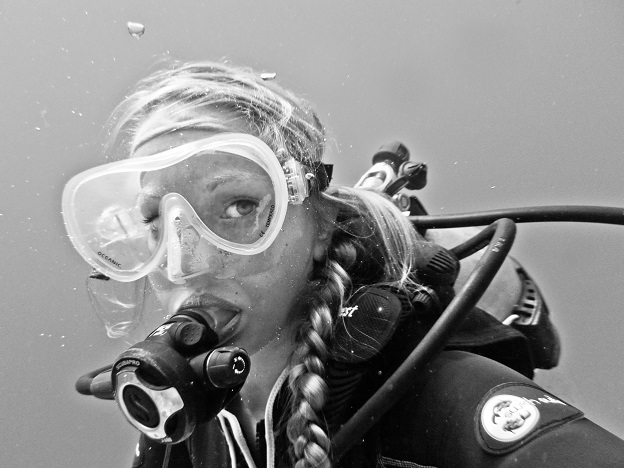 Alexandra Baackes is a traveling writer, designer, and underwater videographer, currently in her third year of living as a full-time nomad. You can follow her adventures on her blog Alex in Wanderland. Thank god she posts every day b/c her blog is my favorite! But Alex, Channing Tatum, I’m shocked! I just picture you choosing like Emile Hirsche or someone more braniac-like! Really? I could’ve almost guessed Channing! Haha. Or maybe someone like Josh Hartnett or Zac Efron. How I wish I was diligent enough to post every day..she must never sleep. nice pics. such a nice experience. thanks for posting nice views. I have seen her blog and I must say that she gone to places that I wanted to go. Nice interview btw.